Here is another great toy from Magic Cabin! 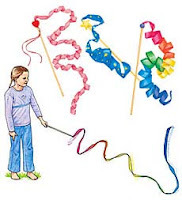 Silk Streamers are great for encouraging creative movement in your child. Children of all ages love to play with them. We’ve had teenagers play with my daughter’s rainbow silk streamer. At $8.95, this is one natural toy that is affordable. We have had our silk rainbow streamer for 3 years. The wooden dowel handle broke, so now we simply have a shorter handle. My daughter loves to dance around the house with the silk streamer swirling around her (I think it is fun to play with too! )Magic Cabin offers the silk streamer in three styles: rainbow, starry blue celestial, and heart. The heart silk streamer would make a nice Valentine’s Day gift.